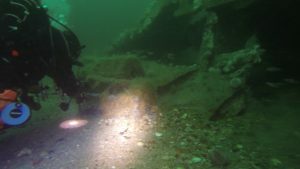 Just two club members (Martin and Garry) joined this trip to the deeper wrecks that lie between the Firth of Forth on the east coast of Scotland, and the Farne Islands in Northumberland. 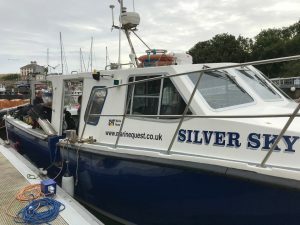 We dived and stayed with Marine Quest in Eyemouth. 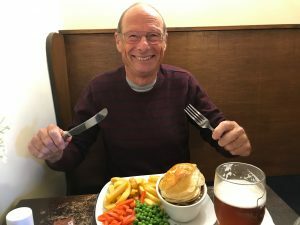 It took about 4.5 hours to get to Eyemouth on Thursday afternoon; we arrived in time for a pie and a pint at our usual haunt, the Contented Sole pub by the harbour. Over dinner we revisited our decompression and gas strategies, having opted for twinsets of helitrox (26/17) as back gas to minimise narcosis, and a stage of nitrox 50 for decompression. Friday morning arrived early as we were awoken by the calls of seagulls, but after a full Scottish breakfast, we departed the port on the Silver Sky at 9am to dive the U-12. This is a German submarine that was sunk on 10th March 1915, having been rammed by the HMS Ariel. 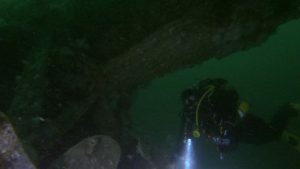 The wreck lies upright on the seabed in 48m of water, and is largely intact, although several hatches have been trawled off allowing divers to peer inside. Neither propeller has been salvaged, and the rear torpedo tubes are open, with a torpedo still visible, loaded inside the port tube, as if still ready to go. 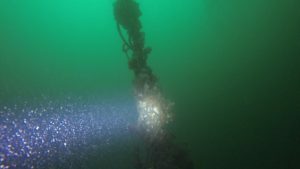 The wreck is covered with lost fishing nets, including a particularly large one that formed a towering column that rose from the wreck behind the conning tower. The visibility was excellent at 8–10m, and we were reluctant to start our ascent once our planned twenty minutes of unaccelerated decompression had been accumulated. Collecting our tags on the lazy shot on the way back, we stopped at the indicated depths to start decompressing. Switching gas to 50% I turned the cylinder valve to be greeted by a huge volume of bubbles from the second stage. Quickly closing the valve, I decided to ascend to the next stop before having a second go. Squeezing the hose back on itself, I had the same freeflow, so I gave it up as an unfixable problem. Fortunately, we’d planned to have enough back gas to complete the required deco stops, so this just meant a few more minutes in the water. A thermocline meant the temperature was appreciably warmer from about halfway up the line! We arrived back on the boat ~50 minutes after we left having reached a maximum depth of 46m. It was to be the only dive that day, due to the timing of slack and being 30 miles offshore, but it was well worth it – I shall look forward to returning to the U-12 another day! We began the three-hour steam back to Eyemouth, tucking into some excellent lemon cake, and rewarming with hot tea and coffee. Day 2, Saturday, ropes off at 9.30am. This time our target was the “Upsidedown wreck”. The underwater visibility was 8–10m at 42m. There were lots of lost lobster pots on the seabed surrounding this wreck, and a couple had not been there long. Garry released a crab and a plaice from one, and made it safe for other marine life by cutting open the door. Again, despite extending our planned maximum time-to-the-surface to twenty-five minutes, it was soon time to go. I’d switched regulators on my stage bottle, and this time everything went to plan (albeit a lost tag meant we only didn’t release the lazy shot because we’d seen a diver still on the wreck) and we arrived back on-board safely with a 60 minute run time. 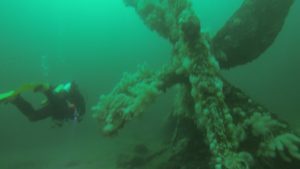 The second dive was on the Primrose, a steel-hulled fishing trawler, sunk close to the Isle of May in the Firth of Forth on 11th November 1904. The visibility was 6–8m at 28m. The engine was clearly visible on this wreck, and navigating around it was very easy. Day 3, Sunday, ropes off at 10am. Our primary target for our last day was the Nidelven, a Norwegian cargo vessel that was sunk by a mine in 27th April 1917 while transporting coal and passengers from Newcastle. She lies south of the Farne Islands in Northumberland. Visibility was a patchy 6–10m at 42m, as we picked our way around the bones of the wreck; this was another very good dive. We finished off the weekend with a quick dip on the Collington(?) (visibility was 8–10m at 7m) on the way back to port. This would have been a large ship judging by the size of the boiler, the pipes from which had now partially collapsed providing a nice swim through the boiler. The wreck lies on silver sand and the boiler is covered by animal turf, including lightbulb and gas mantle sea-squirts, and is home to at least five lobsters. Kelp covers the ribs of the ship, which only protruded a metre above the sand, but these were covered with bryozoan mats, and a variety of brightly-coloured nudibranchs were feasting on them, and laying spirals of eggs on the fronds. Back in harbour we soon departed Eyemouth, looking forward to returning in a month for the annual club scenic week, and arrived back in Warwickshire at midnight, tired, but happy with how the trip went.